Curves rocks. I heart Curves. 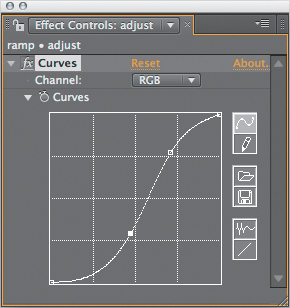 The Curves control is particularly useful for gamma correction. Curves lets you fully (and visually) control how adjustments are weighted and roll off. You can introduce multiple gamma adjustments to a single image or restrict the gamma adjustment to just one part of the image’s dynamic range. Some adjustments can be nailed with a single well-placed point in Curves, in cases where the equivalent adjustment with Levels might require coordination of three separate controls. 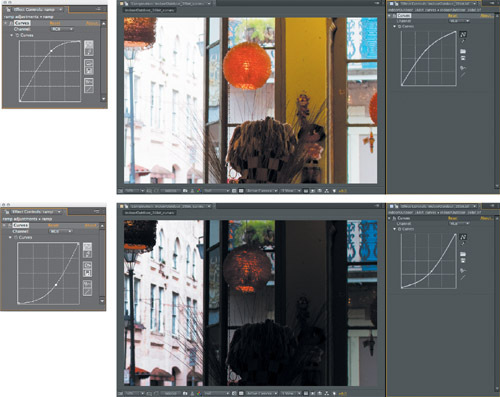 It’s also worth understanding Curves controls because they are a common shorthand for how digital color adjustments are depicted; the Curves interface recurs in most color correction toolsets. It’s not immediately intuitive and can easily yield hideous results if you don’t know what you’re doing. There are plenty of artists who aren’t comfortable with it. Unlike Photoshop, After Effects doesn’t offer numerical values corresponding to curve points, making it a purely visual control that can be hard to standardize. In the absence of a histogram, you may miss obvious clues about the image (making Levels more suitable for learners). The most daunting thing about Curves may be its interface, a simple grid with a diagonal line extending from lower left to upper right. There is a Channel selector at the top, set by default to RGB as in Levels, and there are some optional extra controls on the right to help you draw, save, and retrieve custom curves. To the novice, the arbitrary map is an unintuitive abstraction that you can easily use to make a complete mess of your image. Once you understand it, however, you can see it as an elegantly simple description of how image adjustment works. 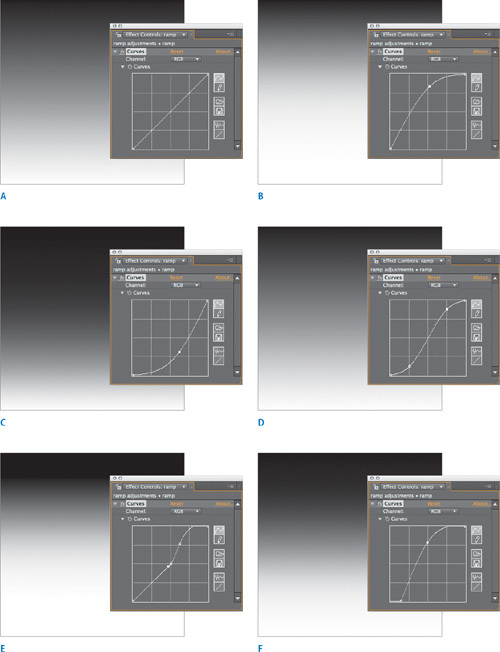 Figure 1 shows the more fully featured Photoshop Curves, which better illustrates how the controls work. Figure 1. 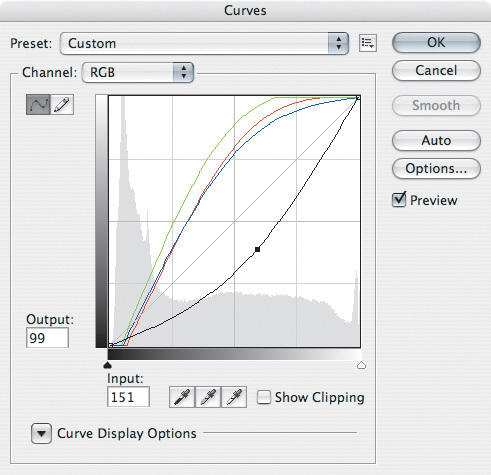 Photoshop’s more deluxe Curves includes a histogram, built-in presets, displays of all channels together, and fields for input and output values for a given point on the curve. 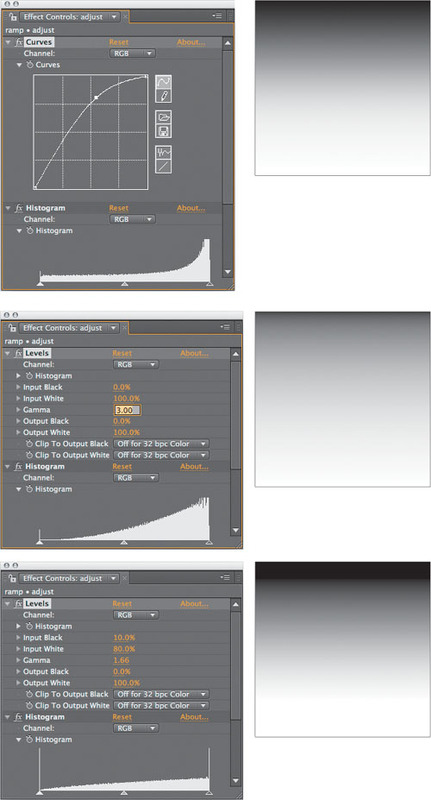 Figures 2 shows some basic Curves adjustments and their effect on an image. Figure 3 uses linear gradients to illustrate what some common Curves settings do. I encourage you to try these on your own. Figure 2. What you see in an image can be heavily influenced by gamma and contrast. A. The source image. B. An increase in gamma above the shadows. C. A decrease in gamma. D. Both corrections combined. Figure 3. This array of Curves adjustments applied to a gradient shows the results of some typical settings. A. The default gradient and Curves setting. B. An increase in gamma. C. A decrease in gamma. D. An increase in brightness and contrast. E. Raised gamma in the highlights only. F. Raised gamma with clamped black values. Most interesting are the types of adjustments that only Curves allows you to do—or at least do easily. I came to realize that most of the adjustments I make with Curves fall into a few distinct types that I use over and over. The most common adjustment is to simply raise or lower the gamma with Curves, by adding a point at or near the middle of the RGB curve and then moving it upward or downward. Figure 4 shows the result of each. This produces a subtly different result from raising or lowering the Gamma control in Levels because of how you control the roll-off (Figure 5). Figure 4. Two equally valid gamma adjustments via a single-point adjustment in the Curves control. Fine tuning follows in Figure 5.21. Figure 5. Both the gradient itself and the histogram demonstrate that you can push the gamma harder, still preserving the full range of contrast, with Curves rather than with Levels, where you face a choice between losing highlights and shadows somewhat or crushing them. 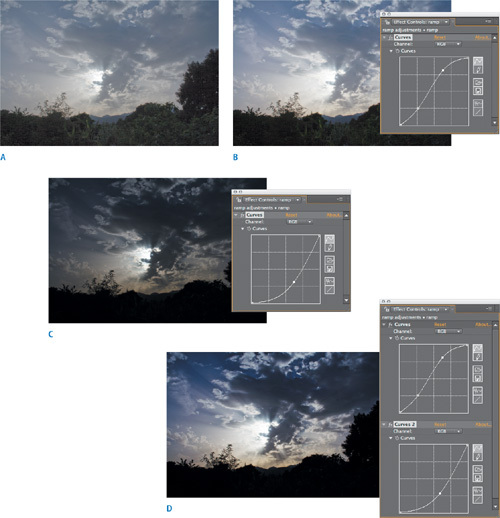 The classic S-curve adjustment, which enhances brightness and contrast and introduces roll-offs into the highlights and shadows (Figure 6), is an alternative method to get the result of the double curves in the image labeled D in Figure 2. Figure 6. The classic S-curve adjustment: The midpoint gamma in this case remains the same, directly crossing the midpoint, but contrast is boosted. Figure 7. Adding a mini-boost to the darker levels while leaving the lighter levels flat preserves the detail in the sky and brings out detail in the foreground that was previously missing. A typical method for working in Curves is to begin with a single-point adjustment to adjust gamma or contrast, then to modulate it with one or two added points. More points quickly become unmanageable, as each adjustment changes the weighting of the surrounding points. Typically, I will add a single point, then a second one to restrict its range, and a third as needed to bring the shape of one section back where I want it.